Our Dota Auto Chess Couriers list page details all of the couriers you can purchase with Candy. In Dota Auto Chess, your default playable courier is the Dire Donkey. If you want to get one up on the competition, or just kit yourself out with a fancy new courier, you’ll need to earn a currency called Candy. Once you’ve got enough of this stuff, you can hit the in-game slot machine for a chance at a unique courier. Below we’ve got an image of all the couriers in Auto Chess, so you can decide which one you want to get hold of. UPDATE - CANDY STORE CLOSURE: Originally you'd need to head to the ebay store in order to purchase couriers with real world currency. According to an update over on reddit, the developers have confirmed that the ebay store has been closed for the foreseeable future. Currently you are unable to purchase candy, but the developers have said they are "working on a new app" which you can buy candy from directly. It was slated to launch on 13th February, but this date has been and gone. We'll update this section once we hear more. There are a grand total of 32 couriers available to earn in Dota Auto Chess. For a more in-depth summary, make sure you head on over to our Auto Chess Candy - How to get free Candy and spend it page. First you need to get hold of some Candy. 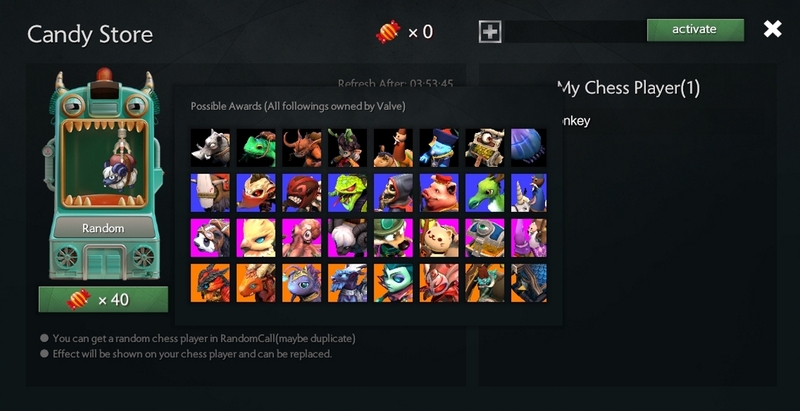 This is the in-game currency used to buy new couriers in Dota Auto Chess. You can purchase Candy via the in-game store, or you can earn it over time by placing highly in Auto Chess matches. Once you’ve got enough Candy, you can use the slot machine for a chance at obtaining a random courier. Here’s an image of all the couriers currently in the shop, taken straight from the in-game client itself. Thanks to metaformose over on reddit, we've posted all the courier names just below. For clarity we'll be separating couriers by rarity, totally made up by us: Common (no colour), Rare (Blue), Epic (Pink) and Legendary (Orange). It's also worth watching this video by GameOver! which shows the process of buying a courier in-game. It's a case of getting hold of either 40 Candy for a chance at the slot machine, or more for a specific courier. In the video it shows 100 Candy needed to directly purchase "Dire2012", but we've also seen this value at a much more expensive price.